Running a tech startup in Libya is no easy business, given political instability, poor infrastructure and lack of capital. That has not put Najla Almissalati, co-founder of She Codes, from trying to make a success of her business, which offers females coding and programming training, aimed at providing them with the skills and knowledge needed to start their own businesses and compete in the job market. Things are not easy, however. “The current situation is really difficult and the political instability is actually affecting everything,” Almissalati told Disrupt Africa. Regular internet and power outages also pose problems, which She Codes is overcoming by pre-downloading materials and using power banks. Economic struggles are also prevalent. “Many Libyan startups are facing difficulties in securing funds. Moreover, the currency crisis and high exchange rate of hard currency makes it really difficult, especially for tech-related startups, as there is always the need of hard currency for bringing the required equipment,” Almissalati said. Yet the startup presses on with its important mission of offering more opportunities to women through training. Almissalati said providing tech skills has many benefits for women in the current climate in Libya. “They could then work from home, especially as Libya is going into instability and sometimes we are forced to stay home for days due to the war in some residential areas. Having the skill and knowledge, they could use their time in working from home, instead of depressing they will feel useful and productive, and they would also earn money and become financially independent,” she said. 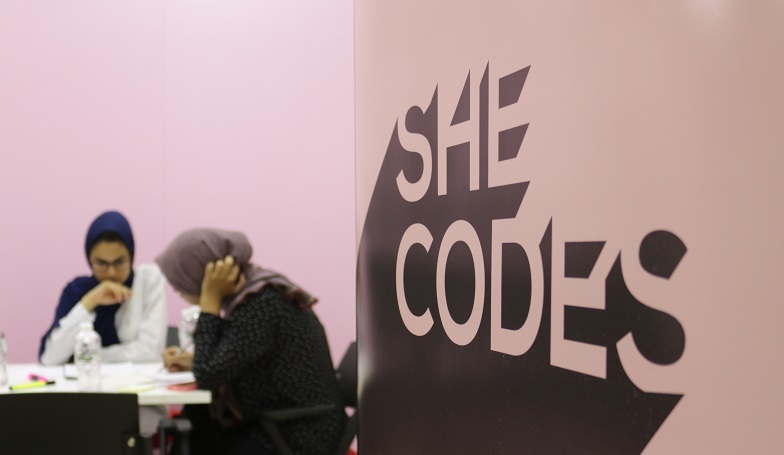 She Codes launched at the beginning of this year, determined to increase the number of women actively working in Libya. But she said for most females it was no longer possible to live on a comfortable dependent salary, and the economic burden is creating an incentive even for conservative Libyan men to allow females to work. “However, the majority of them won’t allow them to work or attend courses where males are present,” Almissalati said. She Codes is the answer to this, with the startup self-funded thus far but successful in raising sponsorship for its first pilot programme. The programmes currently run in Benghazi, but the startup is expanding to Tripoli by the end of the year. “We have an amazing team and a potential partnership with a Libyan organisation that showed interest in funding the bootcamp in Tripoli, plus we are looking at international partnerships for bigger projects that will have a great positive impact on Libya as a whole,” said Almissalati.